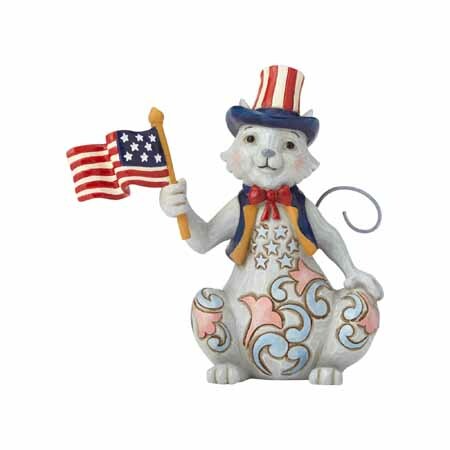 Pint Size American Patriotic Cat | Jim Shore Ornaments Figurines | One Price Low Flat Shipping! From the Jim Shore Heartwood Creek Collection, Pint Size Patriotic Cat w/Flag Figurine. Made of hand-painted stone resin. Measures 5" tall. Packaged in collectible Enesco Jim Shore gift box. Colorfully decorated in red, white and blue, this flag-waving Feline is a fun-loving tribute to the spirit of America. Handcrafted in delightful detail, this whimsical cat design features sentiment, humor and unique artistry that are unmistakably Jim Shore.